The 1973 PAN paperback featured eight exclusive colour photographs by Roger's then-wife LUISA (with four remaining interior and two cover photos by GEORGE WHITEAR), but all are absent from the 2018 printing and one can only guess as to why. However, the 2018 book has other photographs, three of which are extremely similar to a trio in the '73 edition. The first (on the front cover), has Roger holding his gun a little closer to him, the second (featuring a background explosion) is from a slightly different angle and likely taken by another photographer (several captured the event), and the third (a boat chase) appears to have been snapped on a different day. It's a shame that the originals weren't used, but the 'new' photos fill their place admirably and are every bit as interesting. The cover photograph always confused me slightly; was Roger standing on the other side of a glass pane he'd just put a bullet through, or was it a mirror? If the former, then the '70s paperback had the image the right way around - if the latter, the wrong way. The new edition regards it as a mirror image, hence Roger's parting is on the right and not the left, but it's a fine, luxuriant head of hair either way. (So like my own.) It's great to see this book reissued in such a durable format, and if you've never read it, now's the time to do so. Even if you have read it, it wouldn't hurt to reacquaint yourself with Roger's own day-to-day account of filming LIVE And LET DIE, as it's a wonderfully witty and eminently entertaining tale. You can see the cover to the 1973 Pan paperback by clicking here. 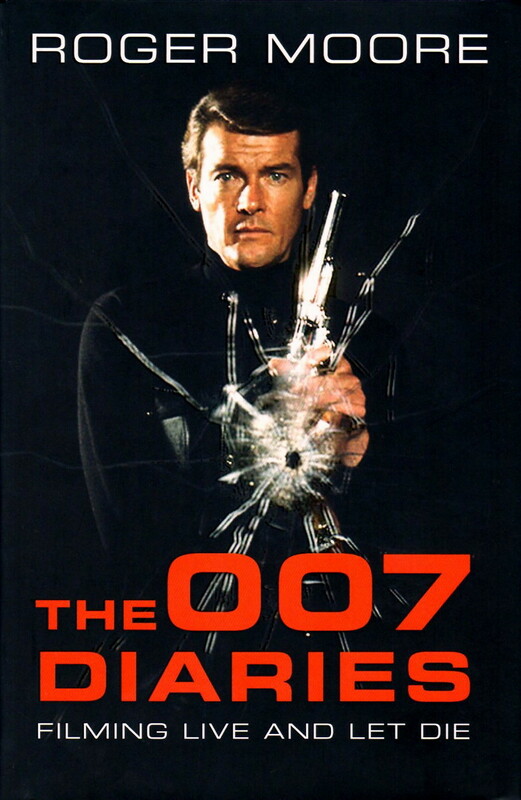 I can confirm that the US edition was called Roger Moore's James Bond Diary. It had the bullet-hole-in-the-glass-pane (or mirror) photo, with sidebar insets of Gloria Hendry and Jane Seymour. IIRC, the back cover was of him with a martini while an explosion was going off in the background. David Hedison was the first actor to play Felix Lieter more than once. In an interview, he quipped that it might become a popular trivia question among fans. Hedison guest starred in "Luella," a 1964 episode of The Saint. 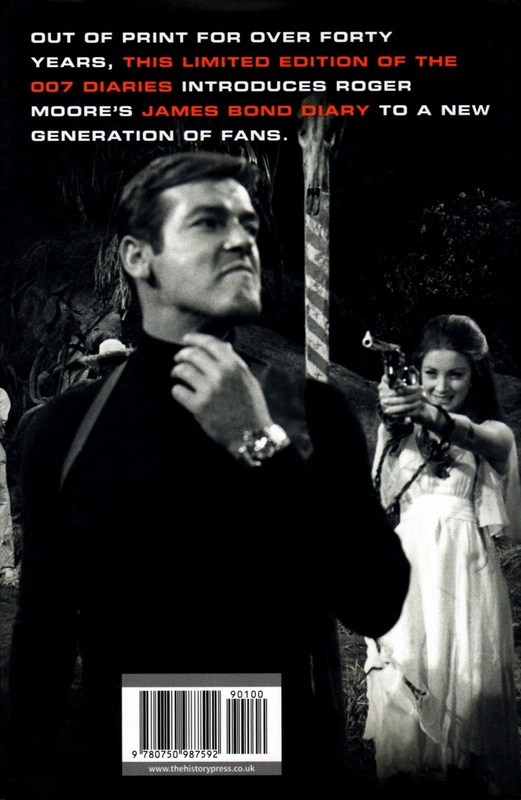 In one scene, a woman mistakes Simon Templar for James Bond. He and Sir Roger also worked together in "ffolkes" (aka North Sea Hijack, aka Assault Force). It may have been Sir Roger who advised Hedison to take the part of Captain Crane on the Voyage to the Bottom of the Sea TV series (1964-68). Reportedly, David wanted to focus on feature films, but Moore's experience as Templar had taught him that doing a TV show could be a good career move. I think Roger was the first actor (British actor anyway) to become a millionaire from a TV series, TC, so he knew what he was talking about if he did advise Hedison. Jack Lord could've been the first actor to play Leiter twice - had he not wanted too much money and co-star billing for his next appearance, thus losing the role. Nice reminder of Roger's turn as Bond this book - well worth having. Whenever Roger Moore is mentioned as James Bond it always comes as a surprise as to me he was TV's Ivanhoe, or Maverick's cousin Beau. George Sanders was a more convincing Saint, and Moores rather smug Bond missed the mark for me. The rather dreadful TV series 'The Persuaders' failed to persuade me it was entertainment though the comic strip in Countdown/TV Action by Frank Langford was good. It would have been nice if Moore played something other than the same smug persona. Did I miss something of his that could pass as dramatic acting? As an aside, in Ivanhoe his squire was played by Robert Brown who in the Bond movies played his boss, M.
I didn't know about George Sanders Saint until well-after I'd seen Roger's TV show, T47, so to me Roger IS the Saint. I do like George Sanders in General though. I also enjoyed Rog's turn as Bond, because even before Diamonds Are Forever, Sean Connery was looking tired of the role - and the role was looking tired of him. Roger was never really given a part which required any great stretch of acting, but he was very convincing in The Man Who Haunted Himself, mainly because it gave him the chance to act someone other than the imperturbable hero. Robert Brown played M in four of Rog's Bond films, though he appeared in five, and it's still a matter of conjecture whether his M was the promoted Admiral he'd played in his first Bond movie, or was meant to be the same M that Bernard Lee played. Yer pays yer money and yer takes yer choice. I never saw The Man Who Haunted Himself so will have to look for that. M was the job title so Robert Brown was probably the former admiral now promoted. The TV show, The Avengers, simply created MOTHER as the M charactor, played by a man. The London region TV used to show old Saint movies long before the TV show was created. If you ever read the short stories of the Saint they were reproduced exactly as the TV shows, it's as if Charteris predicted TV. I think M became the job title, T47, but Bernard Lee's M (and that of the books) was called Miles (that was his Christian name), hence that's where the M originated I believe. Back in the early to mid-'70s I read the books regularly and always enjoyed them. Must re-read them at some stage. Say what you like about Roger Moore but I actually liked the guy and his relaxed way he acted...I thought the funniest role he played was in Cannonbal Run where he played the role of contestant as James Bond. Aston Martin and all...I believe he wasnt very popular afterwards with the Broccoli family...Great stuff Sir Roger !! He played Seymour Goldfarb Jr., who seemed to think he was Roger Moore, so he wasn't actually playing James Bond himself, LH. At least we got to see him driving an Aston Martin DB5 - it's a shame he never got to do that in a Bond movie. A knighthood wouldn't have been enough for putting up with Tony Curtis - they'd have given him The Order Of The Garter as well. The only interesting thing about The Persuaders was the opening credits which included pictures of Tony Curtis in uniform as a US Sailor and Roger Moore in uniform as a Guards Officer which they actually were at the end of WW2. I quite enjoyed the show at the time, T47 - typical ITC-type entertainment. And the John Barry theme tune was great, I thought.